See Using DirectX Graphics for more information. Run as few other programs as possible in the background. On the Video Mode window that comes up when you launch the game, choose to play in a window and then select a small size for the window. Alternately, run the game, select Game Options on the title screen, and set Game Area Size to Small. Run the game, select Game Options on the title screen, and set Graphics Extra Details to Don't Draw. If GUI elements are truncated by the edge of the screen, or disappear altogether, this could be because your PC is configured to display text at a larger setting (125% or upwards). 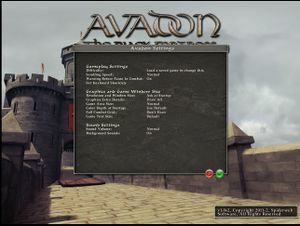 Right-click on the game's executable; for example, C:\Program Files (x86)\Steam\steamapps\common\Avadon The Black Fortress\Avadon.exe. 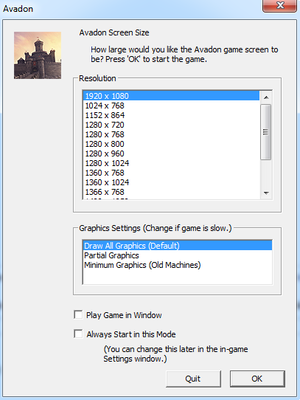 Turn on Disable display scaling on high DPI settings. This page was last edited on 5 March 2019, at 21:38.